Some may see him as a Downtown Fresno crusader, or an unjust king – depending on whether or not he removed your post from a certain Facebook group. The Facebook group is a place where downtown excitement can grow, and people interested in getting involved can start the conversation. The group also allows for others to voice their concerns, share events, and express their objections, which could potentially create some conflicts when you have a group of over 7,600 members. However, JD isn’t looking to make enemies or hold grudges. Instead, he and his wife just want to see a thriving downtown economy. A place where art, culture, liveliness, and nightlife makes downtown Fresno the heart of the city once again. While it seems to be easier said than done, that’s not stopping these two from creating opportunities to bring more people downtown. To the Fosters, downtown is a shared passion and the place they call home with their daughter. Courtney works out of their house and JD works on the High Speed Rail project. Living and working downtown continues to be an adventure, but they’re running into the same problem that has cursed downtown for years: the lack of nighttime and weekend entertainment. Breaking the cycle of the 8 to 5 workday influx of spending time and money is a daunting task for any group, let alone any two people. Be that as it may, JD and Courtney want to be part of the solution. Now the couple are partnering with T.W. Patterson to host a jazz and craft cocktail pop-up event in conjunction with Downtown Fresno Partnership’s Fulton Street Party, this Saturday, October 21st, from 3:00 PM – 12:00 AM. 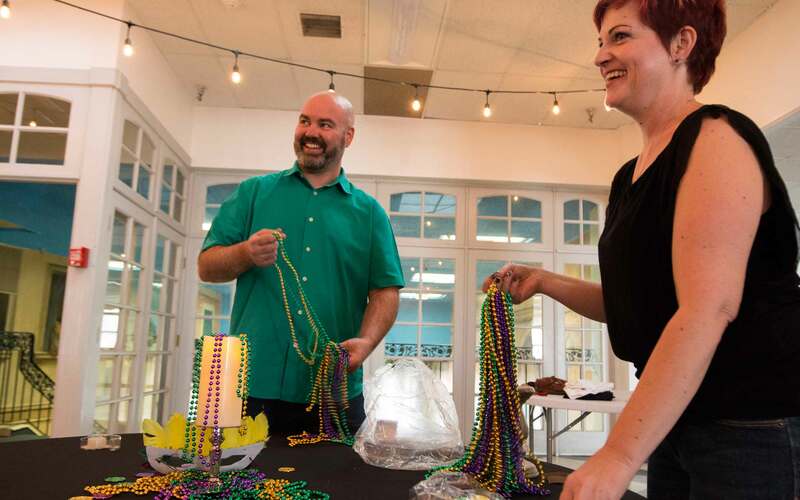 JD and Courtney want to bring a little flavor and a lot of fun to downtown with Lil’ Bourbon Street. The pop-up will be serving cajun-style food and hosting a solid lineup of jazz bands including: Fresno State Jazztet, Richard Giddens Quintet, Rumba 32, the Viper City Brass Band, and the After Dinner Mints. Sazerac: A classic New Orleans drink made with rye whiskey and a bit of absinthe. Roffignac: A concoction of cognac mixed with a raspberry shrub and club soda. Hurricane: A double pour of rum (both gold and silver), mixed with orange, lime, and passion fruit juices, and a touch of grenadine. JD warns that these drinks will go down without any effort, and there’s a possibility they convince you that you’re a much better dancer than you really are. Even though this is a one off event, JD and Courtney are interested in gauging the reception to see what type of appetite there is for a similar venue. It also gives people a chance to make a trip downtown to see what a thriving and vibrant urban core looks like. That’s how you change someone’s mind. Facebook arguments and discussions are just that – all talk. It’s going to take makers and doers like the Fosters, who are willing to walk the walk.